There is no exaggeration to say that most locals in Guilin start their breakfast with a bowl of Guilin mi fen (Rice noodles); And, it is easy to find a noodle restaurant within 100 m of any town or city area. You don't even need to ask someone whether it's good or not. This dish has withstood the test of time since its development in the Qin Dynasty over 2000 years ago - and to this day it is known throughout China. As the name suggests, the dish consists of soft white rice noodles. They are served plain in mild pork or beef broth along with a few roasted peanuts and possibly a few pieces of some kind of meat. And, self-service condiments that are for grabs at all Guilin noodle restaurants, including Chinese Pickled Vegetables, Green Onions and chili flakes. To make flavord noodles, a a key material needed is the secret-made brine in all rice noodles restaurants. 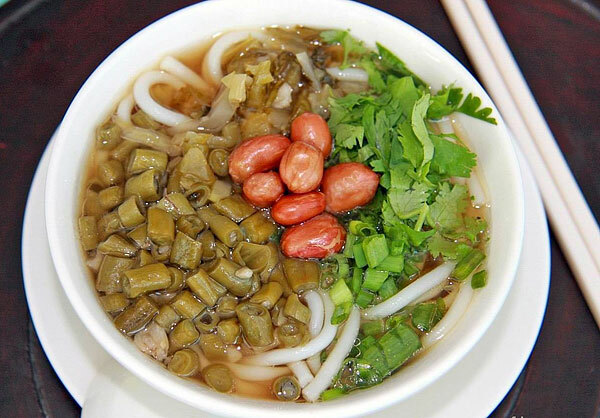 Guilin Rice Noodles represents the regional food culture. The cuisine in Guilin is similar to the mild and fresh Cantonese style of Guangdong province to the east, but also strongly influenced by the strong and spicy flavor to its northern neighbors Hunan and Sichuan.